Autocross is a form of motorsports that emphasizes safe competition and active participation. An autocross is a timed competition where drivers navigate one at a time through a defined course on either sealed or unsealed surfaces. Autocross differs from road racing or oval racing in that generally there is only one car on the track racing against the clock rather than other cars. As an entry level motorsport it provides a stepping stone for drivers looking to move into other more competitive and possibly expensive forms of motorsport including, on-track driving (DE’s), rallies and Club Racing. Events typically have many classes which allow almost any vehicle, from economy sedans to purpose-built vehicles, to compete. Due to the nature of a typical track speeds can be slower in absolute terms when compared to other forms of motorsports, usually not exceeding highway speeds, but the activity level (measured in discrete turns per minute) can be higher than even Formula One due to the large number of elements packed into each course. ARPCA follows PCA Parade Autocross Rules. We use the “Medium” region car classification system. There are four categories of classes for Porsches – Showroom Stock, Production, Improved and Modified. Categories are related to automobile configuration. There is a separate category for all non-Porsche vehicles. Showroom Stock (S) category contains classes of automobiles as normally delivered and specified for use in the United States and Canada. Factory options as normally available for a specific model year are permitted. Certain factory and/or dealer installed equipment/ options will move an automobile out of S and into Production or higher so as to maintain the intent and integrity of the Showroom Stock classes. Choose this class if your car has no modifications. Production (P) category contains automobiles (as normally delivered to the United States and Canadian public through authorized sales outlets of the manufacturer) plus others with limited performance-affecting changes from stock. In general, you will choose this class if you have minor upgrades to suspension components, “chipped your car”, etc, but you have not added significant performance modifications and the car is still street legal and running on street tires. Improved (I) category contains automobiles with more substantial performance-affecting changes from standard (stock) specification, whether changed by the factory, dealer or owner. These modifications have defined limits. These automobiles are classed according to their number of cylinders and actual displacement. Read the PCA Autocross rules to determine if you are running in the Improved or Modified categories. Modified (M) category contains automobiles that have performance-affecting modifications outside of the limits of the Improved category and for race automobiles (factory-built or otherwise). These automobiles are classed according to their specified number of cylinders and actual displacement. X-Class – Non-Porsche (X) category contains all non-Porsche automobiles. These automobiles are classed according to their specified number of cylinders and actual displacement. 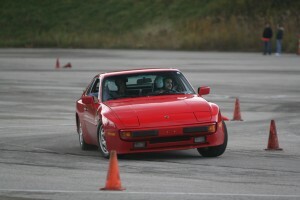 To compete in Porsche classes, your car must have a Porsche Chassis, Engine and Transmission as defined in full rules. This Document is just a guideline and is only meant to get you started. If you have any questions, before you run an ARPCA event, ASK a tech person to help you make sure your car is properly classified.